If Metro wants to live up to their responsibilities, Councilman and Metro Chairman Jim Graham says Metro will need approximately $1 Billion to do it. 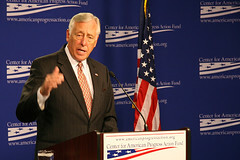 Today, Majority Leader Steny Hoyer (D-MD) has petitioned Congress for $3 Billion. I’m not sure why the figure mis-match, perhaps it’s to negotiate down from, perhaps it’s to replace every 1000-, 2000- and 3000-series cars, but there it is, clear as day. Will WMATA get the money? I don’t know. If there was a way to make sure that it was spent properly, I’d endorse that, since I trust Metro to manage its money about as much I trust your average quasi-governmental organization to spend its money well: Not. At. All. So, will this help? Or will Senator Coburn strike it down, yet again? Wish he’d address the systemic maintenance issues in all the major cities that have heavy urban rail instead of only Washington. Philly, Baltimore, New York, Boston, Chicago, Cleveland, San Francisco, even Atlanta and Los Angeles all have heavy urban rail and most have systems old enough (L.A. might not need it) to require some preventative maintenance right about now.